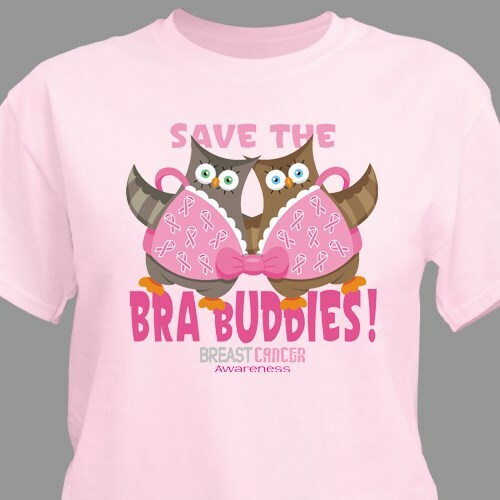 Join the millions of people committed to finding a cure for breast cancer by wearing this unique Save the Bra Buddies Breast Cancer Awareness T-Shirt. Our Breast Cancer Awareness Shirt will definitely get your message across at your next event. This eye catching design is sure to get the conversation going about breast cancer. Our Save the Buddies Breast Cancer Awareness Shirts are a great way to support the fight against Breast Cancer. This Breast Cancer Awareness Shirt is available on our 100% cotton preshrunk T-shirt, machine washable in youth sizes XS-L & adult sizes S-3XL. For every item purchased from our Breast Cancer Awareness Line, MyWalkGear.com will donate a portion of the sales to the Susan G. Komen foundation to help find a cure.Be sure to also view this design in our Save the Bra Buddies Sweatshirt and our Save the Bra Buddies Key Chain as well.